NOTE: January, 2013 - Since the original version of this post in April, 2011, we're proud to announce that the Suffolk County Democrats have implemented our new CommuniTree system, designed in conjunction with Matt Jennings, Suffolk County Democrats Executive Director. CommuniTree allows for integration of dozens of sites under one central control and is a powerful community-building tool. Click here to find out more about CommuniTree. 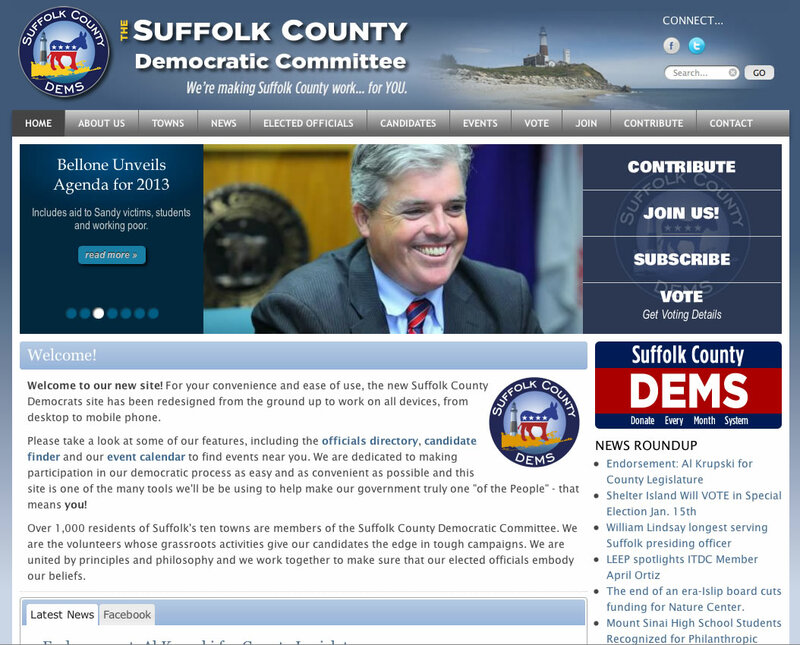 When the Suffolk County Democratic Committee needed to revamp their institutional website, they called InterCreative Media. The site needed to serve multiple purposes - to present information about dozens of officeholders in a way that would be easy to navigate - yet comprehensive - and to make an impression that was engaging and energizing for site visitors. We started with a true "re-branding" approach, creating two new logos for the organization that project the commitment and patriotism of the organization in a modern, impactful way. The site design is colorful and exciting, without sacrificing any of the functionality and voter engagement tools you'd expect for a site serving the almost 300,000 Democrats in the county. InterCreative created an officeholder directory that fits neatly on one page (without scrolling) and yet provides a simple interface allowing the user to easily "drill down" for information for all Democratic officeholders on the local, county, state and federal level - from Town Council all the way up to the White House. Candidate Spotlight, Photo Galleries, Video - you name it. In conjunction with the Nassau County Democrats site, InterCreative is honored to now "cover" all the Democrats in Long Island.